Notes on non-nominal systems: I believe I have gotten the 3rdcharge controller back online, but I won’t know for sure until tomorrow. In the meantime, SOC remained critical all day. I did forget to turn on the generator last night, but I will run it tonight and see where we are tomorrow. Generator (hours run): Not run at all in 24 hours. Turned on this evening at 8 pm. Water (trailer) – 50 gallons. General notes and comments: I have about 15 bags of trash in my truck that I will take to town and try to dispose of tomorrow. Unfortunately the last two crews did not separate the trash so very little could be burned. We gave tours to approximately three dozen folks over the past two days. I love positive outreach and sharing MDRS with people. Kay and I installed about ½ of the new white cover to the tunnels today. (It was brutal so feel sorry for me!). The covering will be taken down after the film shoot and will be stored until fall, when we will put them back up for the field season. Specialists from the NorCal Chapter have been here for the past two days solid working to repair and maintain the suits for the upcoming Crew 196. They cleaned and repaired all the packs, replaced all faceplates with new acrylic ones and all ten are in prime condition for the film shoot. I will need to deliver them to NorCal at the end of the season so they can upgrade them before next season. 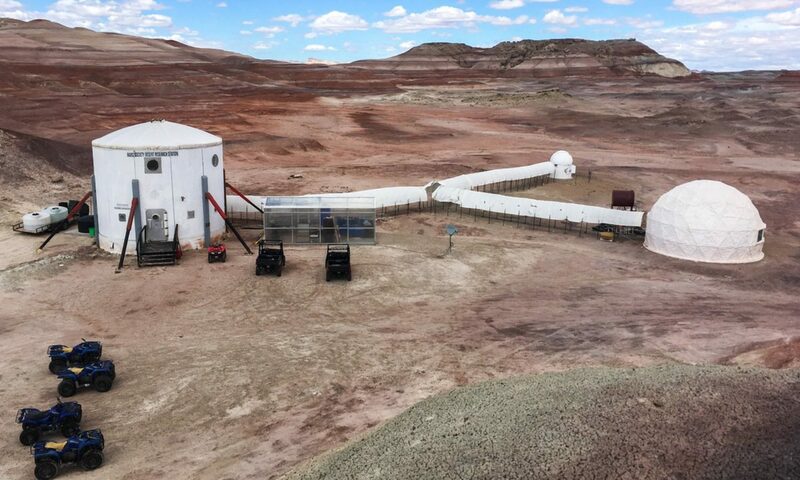 Their dedication to MDRS is deeply appreciated because this was a huge task for them to complete in a short time period and they dropped everything to come and contribute to our success. This kind of thing is what makes MDRS so amazing. On the other hand, there appears to have been an inadvertent theft of all the radios by Crew 195, as they are all missing. I suspect the crew though they were theirs (as they were all new and pretty, so different from past years) and they took them with them. I will be contacting them to get them back. In the meantime, we only have six new ones for the URC so the loss is critical. Summary of Hab operations: The toilet smells pretty bad and shouldn’t. I’ve flushed it twice now and will do it several more times over the next week. It will be closed to all during the URC. Summary of GreenHab operations: All of the crops have been removed. I still need to clean the GreenHab to prepare for the plants we will be using for the film shoot. We have 50 producing plants that will be brought in on June 4th. Summary of RAM operations: All URC packages have been stored in the RAM. The NorCal team used it for their spacesuit work and they really enjoyed working in it. The power was supposed to be installed two weeks ago but it hasn’t. I will be working hard to get power there in the next week.